Day: Saturday, September 20, 2014 NOTE: this event has already happened, find current-year events on the events page. Contact the event organizers, which took place in 2014. Mark Czajka, Director, MD Volt Inc. organized the event. During a presentation and award ceremony, Mark read a Proclamation from Mayor Stephanie Rawlings-Blake, proclaiming September 15-21, 2014 as "National Drive Electric Week" in Baltimore. MD Volt Inc. presented "Best Place to Plug In" Awards to Montgomery and Howard Counties for their recent legislation combating ICING of electric vehicle charging spaces. Tommy Heyboer, Legislative Aide & Deputy Chief of Staff, Office of Council member Hans Riemer, received the award for Montgomery County. Tommy Underwood, Special Assistant to Council member Jen Terrasa, received the award for Howard County. Also attending were Jill Sorensen, Baltimore-Washington Electric Vehicle Initiative (BEVI) Executive Director and Board Member and Dina Beaumont, daughter of the late Bob Beaumont. Bob Beaumont created and built the CitiCar and the Tropica electric vehicles. from 11 a.m. to 4 p.m.
Talk with EV owners about the benefits of driving electric. Learn how easy it is to charge an electric car. Learn about EV Rebates and Tax Incentives. Receive free giveaways, celebrate award presentations and more. Event is open to everyone. Register today, drive or ride in a car at the event, and win a free t-shirt or prize (while supplies last). You could also win a family membership to the Maryland Science Center! Click Here! Maryland Science Center as well as other goodies! AT MARK@MDVOLT.ORG IF YOU WOULD LIKE TO PARTICIPATE. 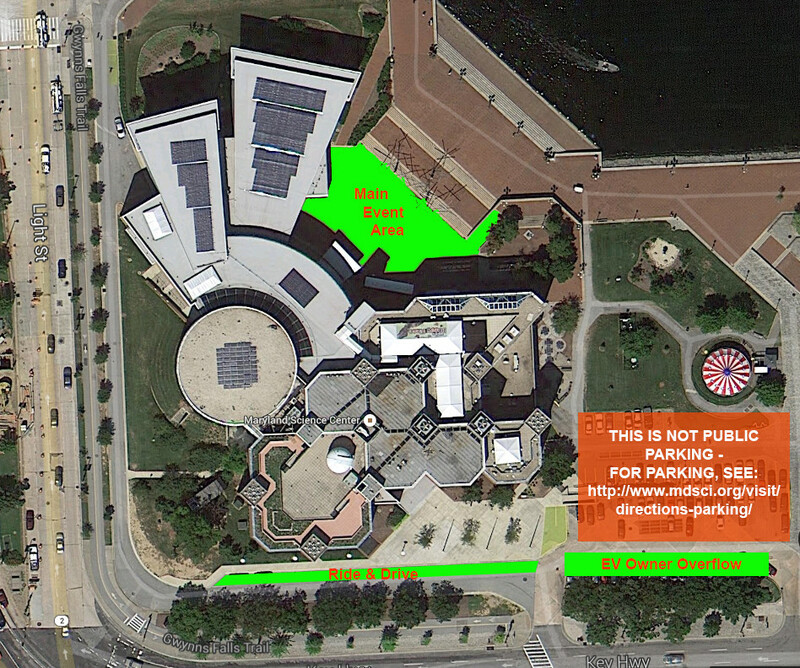 For guests NOT bringing an electric car, click here for parking information! NOTE: MSC WILL ONLY VALIDATE PARKING IF YOU HAVE PURCHASED A TICKET TO THE CENTER! WE ENCOURAGE YOU TO USE MASS TRANSIT TO GET TO THE INNER HARBOR ON SATURDAY! There are currently 130 attendees registered. Registered attendees report 506,335 electric miles driven.